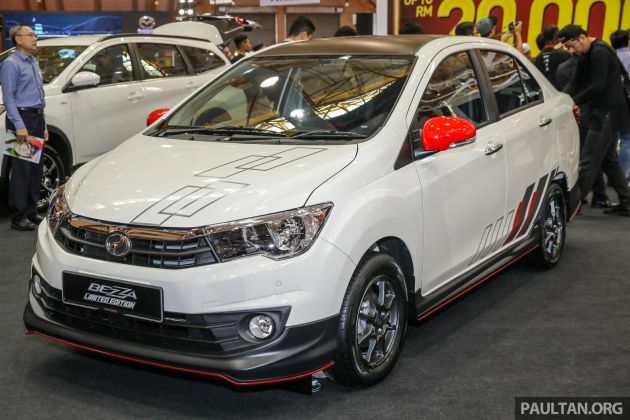 Perodua has introduced the Perodua Bezza Limited Edition at the Malaysia Autoshow 2019, which is happening from now till Sunday at MAEPS Serdang. The Bezza LE is limited to 50 units and will only be available for booking at this four-day event. Priced at RM44,890 on-the-road before insurance, the LE is a sporty take on the Bezza 1.3 Premium X. Its Ivory White paint is contrasted with a full GearUp body kit, finished in matte black with an all-round red pinstripe. The bodykit is matched with a matte black rear spoiler, a blacked-out roof and dark grey alloys. Rounding off the exterior changes are red wing mirror caps and geometric graphics on the bonnet and lower sides. Inside, the Bezza LE comes with GearUp seat covers with new red stitching, red air vent surrounds and GearUp coil mats. “The Perodua Bezza Limited Edition is all about sporty individuality. With GearUp accessories exclusive to this model, you can now proudly stand out from the crowd in Malaysia’s favourite sedan,” said Perodua Sales MD Datuk Zahari Husin, who added that the P2 has sold over 145k units of the Bezza since its 2016 launch. “The continued success of the Perodua Bezza is attributable to its fuel efficiency, quality, dependability, space, practicality, ease to drive and low ownership costs – all in a compact, great-value package. We thank all Malaysians for strongly supporting the Bezza and all our other models. We will continue to improve ourselves to serve you even better,” he added. The Bezza LE is powered by a 1.3 litre Dual VVT-i engine with 94 hp and 121 Nm of torque, mated to a four-speed automatic transmission. The Bezza 1.3 Premium X is priced at RM41,890 OTR without insurance, which makes the LE RM3,000 costlier. 50 units just to take up the market? doubt it is sufficient. They panicked and needed to come out with something hence this limited edition PoS. Wow, what a good price for a superb sedan with a top quality Toyota engine. No wonder every year, Perodua sells 4X more cars than Proton despite Proton getting all the Government orders. A great looking car for those who still practice inbreeding. I expect 1.3 turbo engine. Turly a poor man’s Ah Beng car. Comes with added 50bhp from those body kits!! Looks like this 50 units are not necessary… Is the same old bodykits without paint job. Better wait for new facelift… Bezza should give full safety as standard like the myvi…. Salez so strong Perodua must create a Game Changing Limited Edition Bezza to bury the Game Over Saga and Persona. P2 tak mau pembeli pikir, krn bila mereka dah pikir diorang akan tau harga servis Bezza lagi mahal dari harga servis Persona. Only in a straight line lol. The beza driver must be smoking or vaping then to ‘smoke’ a civic, lol..
How bout you drive this so called Bezza Sport to one of your big meetings? Baru la stand out from others! Right? You can do all this at any accesories shop, in fact so much better than this junk. Perodua should hire one of these accesories shop as their consultant. No way the Perodua MD is driving this cheap Bezza. He’s driving a Lexus like all the Bigwigs in Perodua. Talking about confidence in your own products! Typical UMW Toyota style, add body kit here and there, turn out become ugly look! Whats with the Mickey Mouse ears (side mirrors)? The ears look like they are red because it cannot stand hearing people keep teasing it about its poor handling lol. Current Bezza owner also can convert. Go to SC and order Gear Up body kit with paint, wrap matte the roof, replace the side mirror cover with red color one & few interior touches that you can buy at Mr.DIY. Get this car… later can fly into the drain. Practical family car……looks abeng-ish now. And why is it still not at least 8 inch screen? Same rims as the premium x same radio as the premium x no touch screen ,only some few touch up and cost more than the premium x THIS IS WHAT PEOPLE CALL “BSNess” if it for me better get new myvi or new persona worth the money and 10x better than this axia siblings where you know how it wobbles when driving . RM45k too expensive, all the accessories used only cost RM15k. Please sell it below RM20k , otherwise no takers. Ugly body kit and underpowered. gone lah…the owner gonna think that this is a premium sports sedan and start cucuk-ing all the cars on the highway…. Budak mana la yang Perodua gajikan untuk design LE Bezza ni.